For as long as I’ve been in sales, guru’s have always focused on the differences between selling products and selling services. The approach, skills and talents required to successfully sell products are quite different from those needed to successfully sell services. A major trend I’ve noticed over the last 5 – 10 years is that the distinction between “products businesses” and “services businesses” has become increasingly blurred; as product oriented companies have added services, and services companies have “productized” their offerings. If you focus on “it” over “now” you are making a product sale. You’ll focus your sales process, marketing and positioning on the product being offered. You’ll gear your sales efforts to late stage buy-cycle opportunities. Because your focus is on the product, you’ll deal with commoditization on a regular basis (you may even be the chief commoditizer), and as a result your margins will be tighter; hence, you’ll focus more on volume. 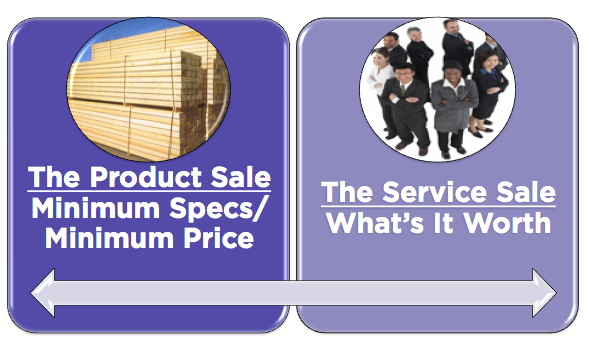 If you focus on “now” over “it”, you are making a services sale. You’ll focus your sales process, marketing, and positioning on the consequences of not getting it now. You’ll spend more time educating your customer base on the barriers to “now” and the impact that “now” has on their organization. Your efforts will focus on radical differentiation, and while your volume may be lower (everyone that needs “it” doesn’t need it “now”), you’re margins will be much higher. You must focus on either “it” or “now;” you cannot focus on both. For those that have been reading this blog for a while, you realize that the product sale focuses on “left-side value,” while the service sale needs to focus on “right-side value.” When you try to focus on both you fall in the middle, and there is no room in the middle. The middle is Death Valley. You face the on-going margin pressure like a products company with the increased complexity and costs associated with services businesses. When you’ve chosen which sale you will focus on, your job is to ensure that everything you do – the questions you ask, the ads you run, the social media strategy you implement, etc. – is completely aligned behind the decision. I am not saying that the product or the service sale is either good or bad. My point here is that they are different. If you want to accelerate your profitable growth in the future you need to chose one - and only one.